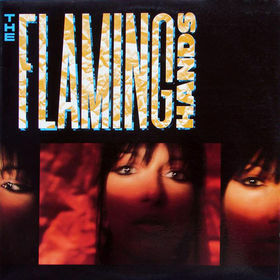 Sydney's Flaming Hands were an early 80s Australian new wave pop band that recorded some amazing songs. Unfortunately, their output never translated to much more than a cult following, and today there is very little information available on the band. Flaming Hands' principal members were singer Julie Mostyn and songwriter/guitarist Jeff Sullivan, who together created something truly special. Sullivan delivered memorable, hook-filled songs that Mostyn made sparkle with her soaring, soulful vocals. The band released their first single - I Belong to Nobody / The Stranger - on Phantom Records in 1980. They followed it up with four more singles - Wake Up Screaming / Sweet Revenge, It's Just That I Miss You / Go Or Stay, Cast My Love / Kismet and The Edge / Sacrifice. These singles were marked by an earthier sound than what Flaming Hands would be producing by the time they released their first and only full-length album in 1984. The self-titled LP, which featured Andrew Fariss and Kirk Pengilly from INXS, is enjoyable but relies a bit too heavily on synths. Unfortunately, the LP failed to get them the recognition they deserved, and Flaming Hands called it quits shortly after its release. Track 5 is missing, but I´ll try to find it. I posted it anyway, because it's a great album. When the album's complete I'll reupload it.